At Casa de San Pedro, in Hereford, AZ, we host a lot of beginning to expert photographers during the year - the San Pedro River affords many opportunities for Nature Photographers to get incredible images of hummingbirds, rare birds, birds that are common to our back yard but not their back yards. 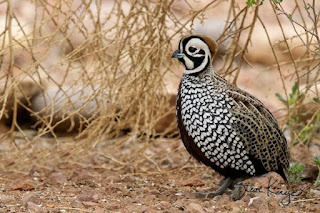 Here is a link to a blog by Steve Kaye who recently visited Casa de San Pedro and got a great pix of our yard Montezuma Quail. This elusive and secretive bird usually stays up in the mountain canyons about 7 miles to the west of us. But, last December a small family of them set up housekeeping in our yard. Two of the birds have relocated but one remains a constant visitor to our feeders. Steve got this pix one morning with Patrick's help. Imagine setting up a 50 lb rig of camera, tripod and huge lens quickly to catch this elusive little guy in good light. Thanks Steve for sharing your great pix! Here's the link to Steve's blog where you can find this pix and links to other great shots that he has taken: http://stevekaye.com/incredible-customer-service/ . You don't have to be an expert photographer to visit Casa de San Pedro. While many of our guests are bird watchers and nature photographers, from novice to expert, many other guests come for the relaxing stay along the San Pedro River, the great breakfasts, afternoon pies. and fantastic weather (we are 20 degrees cooler than Phoneix - so when you want to escape Phoenix at 120 degrees, just think of heading South to Cochise County where we have cooler temps, cool sleeping (at 70 or below every night while Phoenix stays over 100 degrees! yikes! ), and sunny skies. Plus the great birds - as Steve so wonderfully demonstrates.